Google Drive is one of the best Cloud Storage options in the market. It offers sufficient storage for free to fulfill our primary requirements including storing photos, Gmail or various documents. The popularity of Google drive increasing day by day, and we can assume that cloud storage will take the throne from physical storage shortly. So it’s always better to adapt ourselves to changing technology. Moreover, there is no possibility of losing our valuable files and documents if we store it on a cloud. Google Drive offers an official client for all the dominant OS except Linux until now. As a Linux user, you have lots of ways and alternatives for using Google Drive in your system. There are many Google Drive Linux Client software available out there that can do the work for you seamlessly. Here in this article, I will share with you a generic list of top 15 best Google Drive Desktop Client for Linux. You may think that this list is quite long, but I want you to have as many options as possible to get the best one. So before selecting anyone from this list, first install and check all the features and tools and see whether it fulfills your requirements or not. Insync is one of the famous and feature-rich Google Drive desktop client for Linux. You can do almost anything that you need to do with Google Drive. It offers both GUI and CLI interface that helps both new and advanced Linux users to perform the task smoothly. With the help of this Google Drive Client, you can sync multiple accounts, get the desktop notification, sync shared files, and supports Symlink, junction, and alias, etc. Insync is not free. Instead, it comes with 15 days free trial basis and if you like it, pay $29 for lifetime usage. GoSync is yet another best Google Drive desktop client for Linux. It’s written on python programming language and offers an easy to use GUI. Like any other Google Drive Linux client, it also lets you sync files and documents between local and remote storage. If you make any changes in local or remote, it will automatically sync on both sides, and you can also pause or resume sync whenever you want. Maybe you have heard the name of Grive which was a Client for Google Drive sync for the desktop environment. 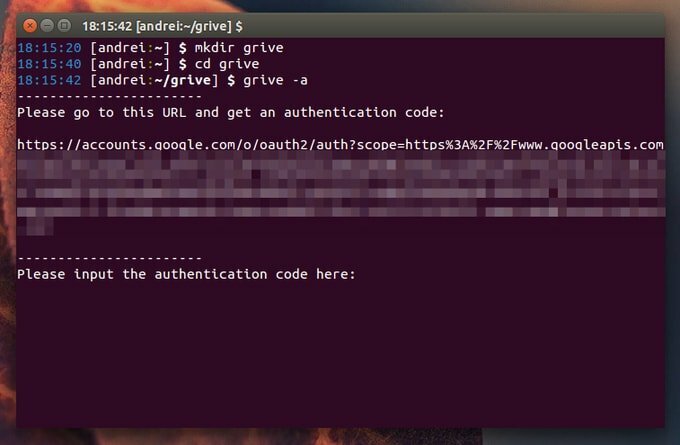 Grive is now abandoned, but Grive2 is there for performing as Google Drive client for Linux which is forked of Grive. It supports the new Drive REST API and partial sync. 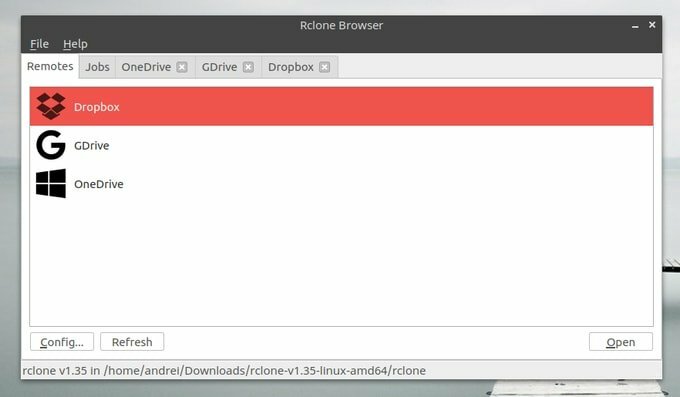 Rclone is a free and open source CLI based cloud storage sync client for all the primary OS including Windows, Linux, Mac OS, FreeBSD, etc. I can’t just say it’s a Google Drive Linux Client instead it’s a complete storage sync software which offers sync of files and documents to and from multiple online cloud storages including Google Drive, Amazon S3, OneDrive, Dropbox, Mega, Box, etc. CloudCross is an open source and cross-platform Google Drive Client for Linux, Windows, and Mac OS. It provides tools and features for synchronization files and documents between your local and various remote cloud storages. At this moment, it supports Google Drive, Dropbox, OneDrive, Mail.Ru clouds, and Yandex Disk. 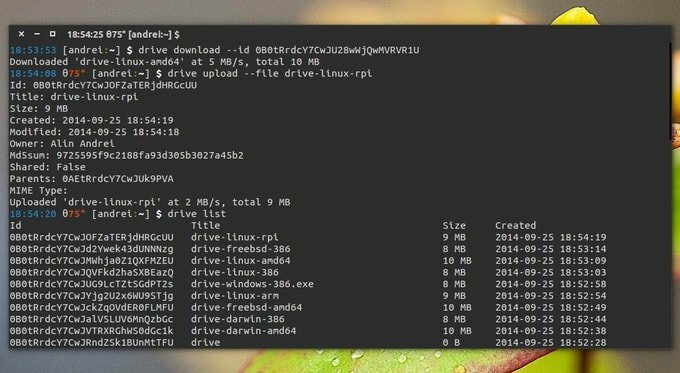 Drive is a command line tool to pull or push Google Drive files. It’s written on Go programming language and does not offer many features. It doesn’t have background sync features and a bit difficult to use for a newbie. DriveSync is also a command line tool for synchronizing Google Drive files and documents on your local system. You can download remote files, upload new files, blacklist or whitelist files for sync, and many such things without any hassle. It can be used as the best replacement of an official Google Drive client for Windows or Mac OS. It’s one of the best Google Drive Client for Linux available right now. One good news for Gnome Desktop user, it provides an inbuilt Google Drive Client for Linux. 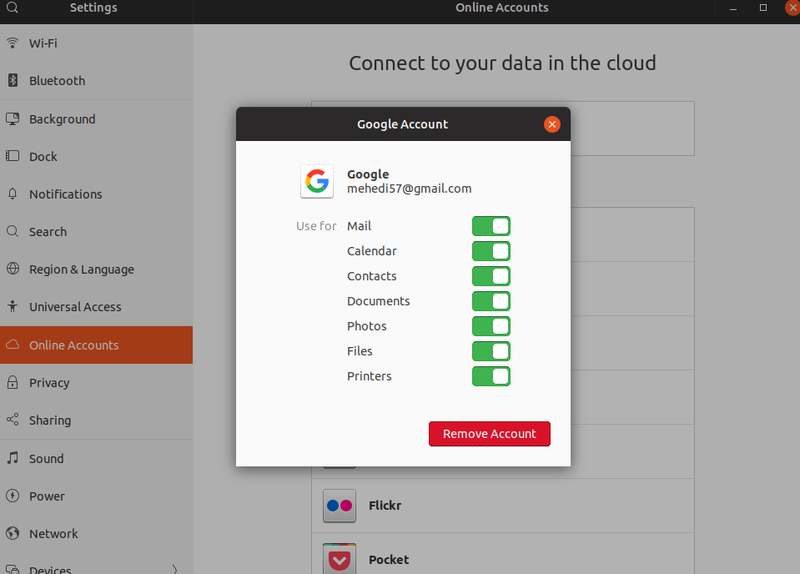 You need to add Google account in Gnome online accounts section under setting. Voila! You are done. Now you can add, sync, copy, delete, etc. from its file manager Nautilus. Though it’s not a full featured Google Drive Desktop Client for Linux, still you can perform some essential task. Gdrive is one of the famous Google Drive Linux CLI clients that frequently used to interact Google drive for incremental and encrypted backup of Linux files. Using Terminal is fun and inquisitive on the Linux system. There are lots of GUI based Google Drive desktop client software available in the market but console based is very less. So here I am introducing Tuxdrive with you which is a CLI based Google Drive Client for Linux. By using this tool, you can get access to Google Drive files and documents, download or upload files, and manage all the things in Google Drive. This Google Drive Client comes with essential features of reading and writes access to ordinary files and folders, read-only access to Google Docs, access to trash directory, etc. It’s a CLI fuse-based filesystem backed by Google itself which supports multiple accounts and let you mount Google Drive on Linux seamlessly. 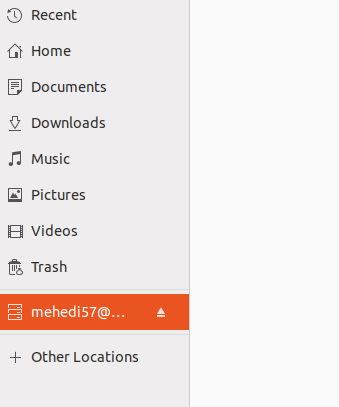 Though it’s frustrating and disappointing that still, Google has not provided any official Google Drive Client for Ubuntu Linux or any other Linux distros. But we have plenty of options to use Google Drive Linux via client software. Here I have discussed a few Google Drive Linux client software which has their strengths and weaknesses. As Best Google Drive Client for Linux depends on users requirement, so it’s complicated to say which one is the best. In this article, you have got both GUI and CLI based Google Drive Desktop Clients for Linux. Which one did you like most from this list? Did I miss any other great Google Drive Linux Client? Let me know your experience and suggestion in the comment below. And don’t forget to share this helpful tutorial on your social media. Thanks for the time you spent here. By ‘supports Symlink,’ do you mean you can choose whether to follow or ignore symlinks? That’s a pretty essential feature, in my view. I have directories that I want to be synced with the cloud, with symlinks to directories and files that I definitely don’t want in the cloud. I also have symlinks within directory structures, and I don’t want multiple copies of the same file to end up in the cloud. Google Drive doesn’t release any version for the Linux. There are various kinds of third-party apps to access the Google Drive. Google Drive will release a version for Linux very soon. Thank you for sharing! Really great! He’s the best Drive I’ve ever used, even though I need a proxy server to access him in my country. I just log into Google Drive on the web when I need to read/write files with my Drive account while using my various Linux computers. No need for any client software. Yes, you are right. Google Drive online access through browser is quite enough for basic task but you can’t deny the beauty of Google Drive client integration with default file manager. Lot of works with Google Drive will be so smooth and easy that will compel you to choose Google Drive Linux Client. By the way, Thanks for the comment. Yes, I meant to add your point that the client indeed has more features. I am really surprised with Linux being so popular internally at Google that they have not developed a full featured client for Linux as they offer in Windows. As a side note, I want to add another reason I use the web version sometimes, on Windows anyway. I have some very large files and large directories on Google Drive, and with the web version I can access them without downloading them to my computer like the client does when syncing takes place, which takes forever and uses up a ton of space on my drives.